DIRECT LUMPER SERVICE Inc. specializes in palatalizing floor-loaded freight from your containers, trailers and boxcars. We take pride in providing a professional and efficient alternative to your labour needs in the loading and unloading of your loose freight by offering skilled workers and a set flat rate per load, taking the guesswork out of your time and costs per load. Our clients can expect a much faster container clearance. Whether you have one warehouse or several within the GTA, we can service them all. Our rates are based on the size (for example 20 feet, 40 feet, & 53 feet containers), piece count and the number of sorts per load giving you foresight into your costs even before we start the load. Our lumpers are paid in accordance to the load and not by the amount of time spent on the load, thus cutting lag time and increasing efficiency. We are very flexible and therefore we can customize your needs to your requirements and specifications. You simply let us know as little as a day before that you require our services and we will have experienced and professional workers at your place of business at the time you specify ready to get the job done for you. We invoice you per load/job leaving you free from hiring any employees and all the paperwork and headaches that go along with it. You are only billed for the work performed and you will know exactly what we charge upfront with no hidden costs or fees. If you do not need our services in between jobs, there is no cost to you. We can accommodate your workload on a daily, weekly, monthly or annual basis. No job is too small or too big for us to handle. There are no contracts or commitments to tie you down either and you can cancel anytime with no penalties. We carry W.S.I.B. coverage and liability insurance as well as aim to maintain a safe working environment for everyone. All we ask is that you try our service and see for yourself. For a dedicated and experienced Lumping Service, call or e-mail us today to load or unload one trailer or container or for a team of lumpers to work on up to 50 trailers and/or containers per day. We have a strong dedication and loyalty to our existing customers, some of which have been with us since the very beginning. We would like to add your business to our list of satisfied customers. Our primary objective is to always provide a dedicated service that satisfies the needs of our customers. Our freight handlers are experienced and dedicated in servicing our customers lumping needs. Lumper Service Inc provides on site and first rate service at a variety of customer locations in the GTA and surrounding areas. We have the ability to "CUSTOMIZE" your loading/unloading requirements to meet all your needs. Coffee, Tea, Garlic, Sugar etc. Our Lumpers are highly experienced to load for weight distribution and cube stability. 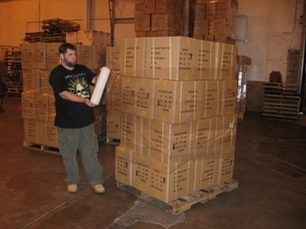 A worker carefully unloads one of thousands of boxes from a container and places it on a skid to be shrink wrapped and stored. Workers can do as many sorts as necessary to meet your needs. 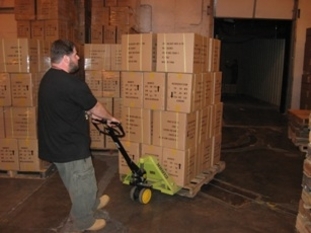 Skids are carefully placed onto a trailer according to a customer's specifications. A worker moves a skid that he just built to be shrink wrapped. The skid is then shrink wrapped from top to bottom according to customer specs. Workers unload thousands of boxes from a container and place them on skids according to size and count that the customer has requested. We charge a reasonable flat rate per load which includes shrink wrapping your pallets. Know your total costs beforehand and upfront. 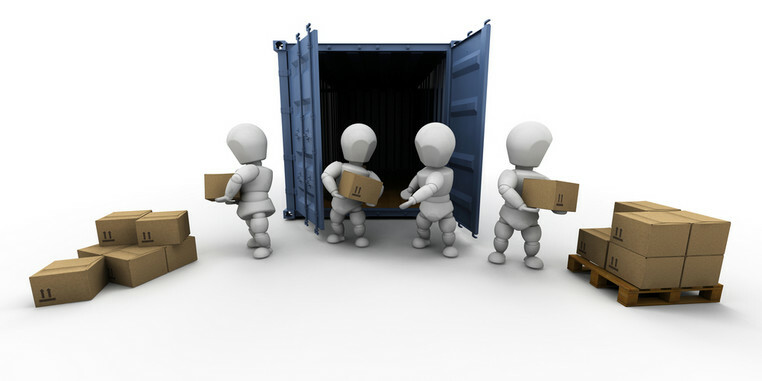 From one container to dozens, one location or several, no job is too small or too big for us to handle. Experienced workers at your location when you need them ready to get the job done right. In the event that one of our lumpers is delayed in reporting to site, then upon notification, another one will be dispatched immediately ensuring your operations will not be compromised and delayed. We have a proud reputation amongst our clients for solid reliability. We have been loading and unloading containers since 1998 so we tend to know this business very, very well. firmly in mind, we maintain Workers Compensation (W.S.I.B.) coverage. This important coverage protects you and us jointly for total peace of mind. Since 1998 we pride ourselves on having provided a wide range of services including loading, unloading, hand bombing, sorting and palletizing all sorts of merchandise. Our workers are highly experienced optimum weight distribution and stability. At DIRECT LUMPER SERVICE Inc, we believe that honesty is not only the best policy, it is the only policy. All workers are carefully background checked and screened. Since we pay them top rates you have the added assurance that you only get qualified and honest workers at your place of business. Our tiered rate schedule ensures that each load will be priced to accurately match the labour required. We will be happy to customize a rate schedule if required to satisfy your specific requirements however complex. During your busy periods, we can arrange at short notice, additional lumpers through our existing network of experienced and carefully chosen part-time workers. Check out a Lumping Service Company and their track record before you sign up with them. You have our trust and loyalty whether you are a small or large company. You have the assurance and peace of mind guarantee of service since 1998. You also have the added benefit of loyal and honest employees. We utilize experienced Team Leaders at the warehouse who in turn supervise and motivate our workers to minimize wasted time and costly unloading and loading mistakes. Additionally. our organization is fully computerized to maximize office and management efficiency. Since we pay our lumpers more, they have the added incentive to get the job done more accurately and faster. We understand the inherent difficulties in switching lumper services, however, as we are fully experienced in a wide range of product handling, any such difficulties are all but eliminated during and immediately after a change over. At DIRECT LUMPER SERVICE Inc, we work as a team and would like to put that team to work for you. Additionally,we would like you to play an important role on our team. Our Team Leader will become an important and integral member of your supervisory staff. We offer the many advantages of a small tight-knit business including passionate commitment, endless enthusiasm, unrivalled dedication and unbeatable costs. This combined with practices that large businesses many times our size would find hard to match such as unbelievable flexibility and efficiency makes Direct Lumper Services Inc a truly unique business proposition. We are totally dedicated and fully prepared to work hard to improve your bottom line while continuing to function as a viable organization which can and will expand to fully meet your needs while giving you the full benefit of a better and more efficient service. A Lumper Service is a 3rd party company that generally is on site that provides unloading services and other services to warehouse and distribution facilities. There are several lumper service companies. Some are on a national level and some on a local level. When looking to outsource your warehouse needs, you should do due diligence on the company you are working with. Most customers go with price when choosing a service. But what some fail to realize is most of the time you get what you pay for and although it might be cheap up front, it could be costly on the back end. A lumper service can be a huge plus to your company. They can cut overtime hours, assist you in day to day operation of your business and back you up when you are short handed. If the lumpers are not productive, it reflects on their payroll so they have a huge incentive to move fast. Here are a few pointers to look for when choosing the right lumper service for your warehouse. They pay on productivity so you always get the job done in a timely manner. Check how many years they have been in business. You can get a good idea of their track record by longevity. Check what type of volume they are use to dealing with. If they have customers in large warehouses this is a good sign of experience. How long have they been at these large warehouses? Verify their safety program and do they carry W.S.I.B. coverage. You would be surprised how many home based lumper services do not carry any W.S.I.B coverage. Again, if the price is low, there is a reason. Should a worker get injured on your property, you will be responsible if the lumer service does not have W.I.S.B. coverage. A Lumper Service can provide great benefits to your warehouse and business. Just make sure you do your homework and take the necessary steps to make it a great relationship for your future partnership.